Males of this large African antelope weighs about 275 lbs. 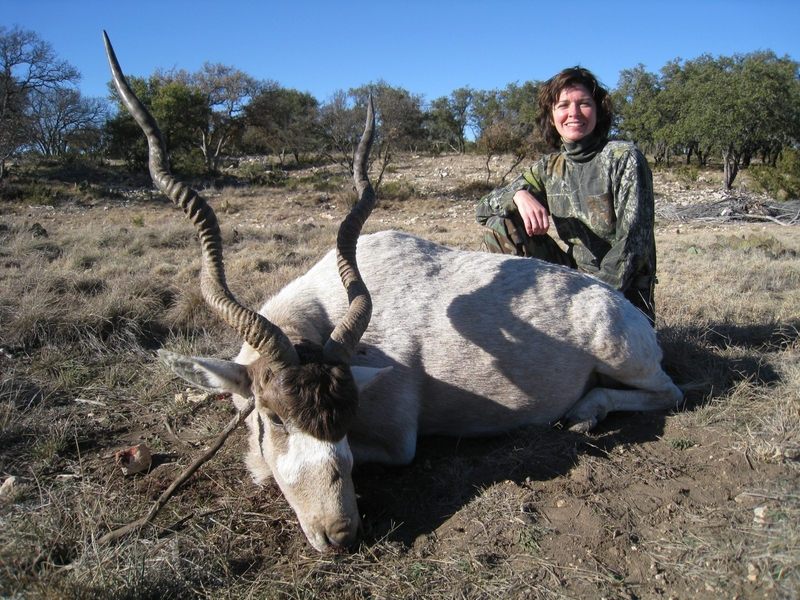 The addax has a white coat with a gray masked face. Their horns corkscrew up creating multiple twists in both males and females. 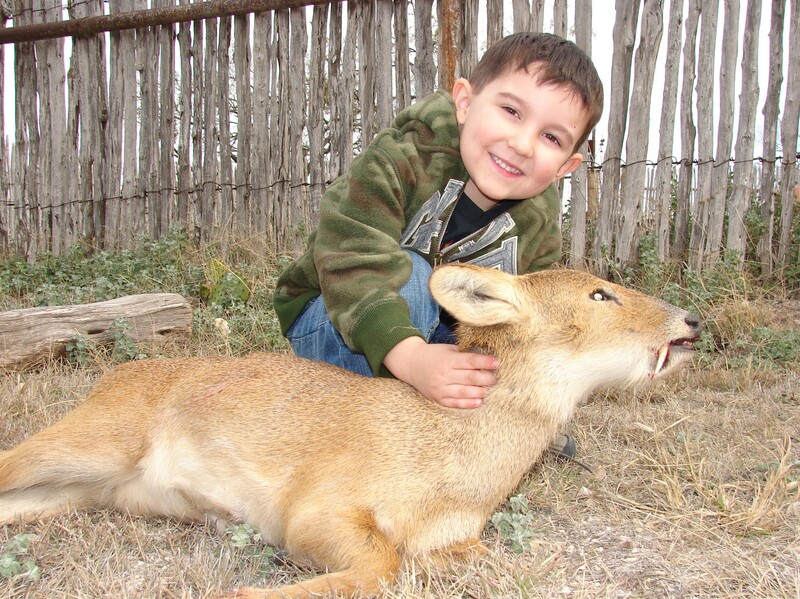 Since these animals are predominately nocturnal, it is a difficult and rewarding hunt! The auodad is a reddish brown animal with a ‘mane' that runs down it's throat onto the chest (in males) and also appears on the legs. The unique horns curve out, down, and back in. Other than the base of the horns, which are wrinkled looking, the horns are smooth in texture. Large males can weigh upwards of 250 lbs. Hunting this animal is a wild, challenging hunt! 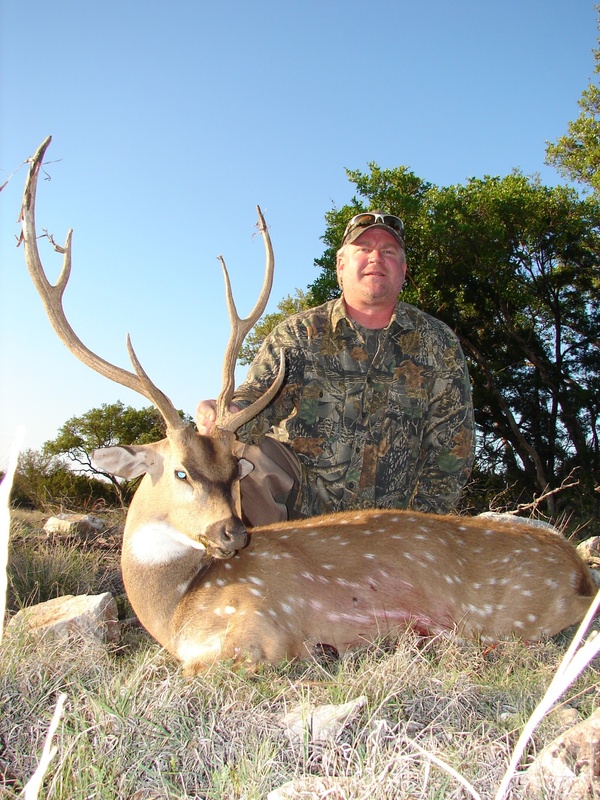 The axis deer's coat is a reddish fawn with white spots. It has been called the most beautiful deer in the world due to their unique coat. The buck's antlers (usually three points per side) sweep upward with stunning forks. Their antlers shed annually so call for optimal hunting season! Blackbucks have ringed horns that have 3 to 4 turns. The upper body is dark brown or black and the belly and rings around the eyes are white. They are found mainly in India but also in parts of Pakistan and Nepal. A large male will weigh about 100 lbs and a female about 75 lbs. 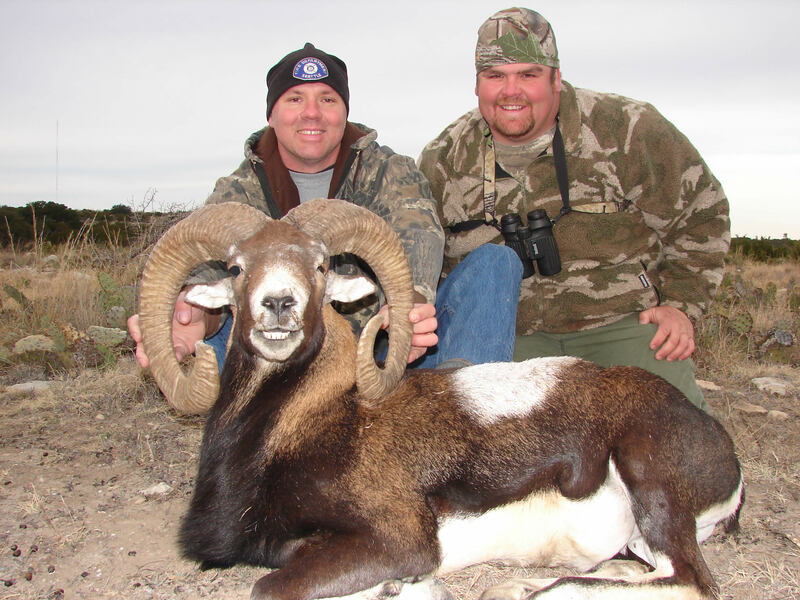 Blackbucks are beautiful trophies! This solid black sheep occasionally will have a white muzzle. Mature rams will weigh 140 lbs. They are noted for their horns which are paired, hollow, unbranched, and not shed. The horns of the adult male are massive, outward pointing, and spirally curved. 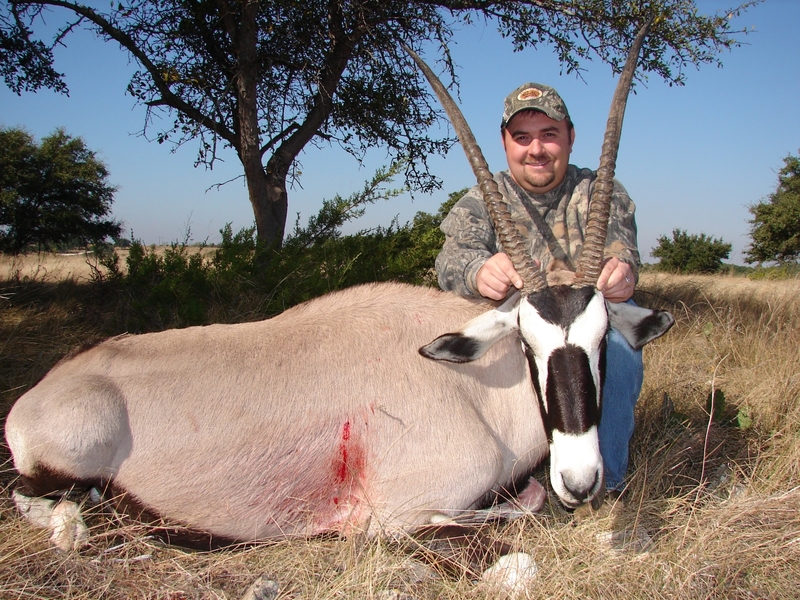 The blesbok is an intriguing medium sized antelope with a distinctive white face and forehead. This animal comes from the plains of South Africa. Both the male and female have horns; the females, however, are slightly more slender. Bongos have a striking auburn coat with 10-15 vertical white-yellow stripes. Coats of the male bongo become darker as they age. Both sexes have heavy, long slightly spiraled horns, though the males are longer and more massive. Bongos do not shed their horns, they keep them throughout their lifetime. Average horn length is between 30-39 inches. They are one of the largest forest antelopes. The true symbol of the American old west. A large buffalo can reach 2000 lbs. This popular exotic sheep is brown with a white or black underbelly. A mature ram will reach around 140lbs. Males will often have long black hair on the neck that many call a ruff. 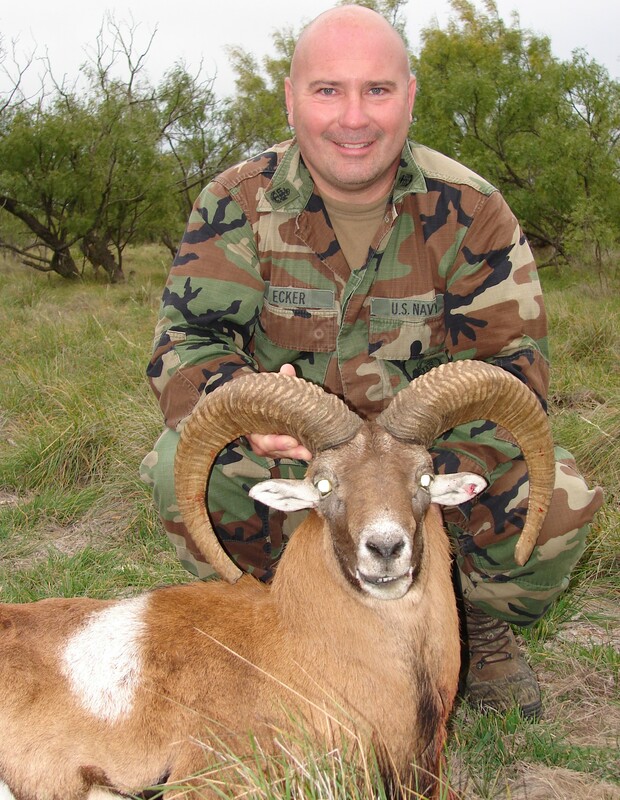 The horns on a Corsican Ram can vary from a tight curl similar to a Mouflon or wide and flaring horns. This deer has tusks that point downward like canine teeth. They are around 3 ft long, about 20 inches tall at the shoulder, and weigh between 20-30 lbs. The elk is the second largest species of deer in the world. The moose is the largest. The elk's large antlers shed yearly. The elk's bugle is one of the most distinctive calls in nature. 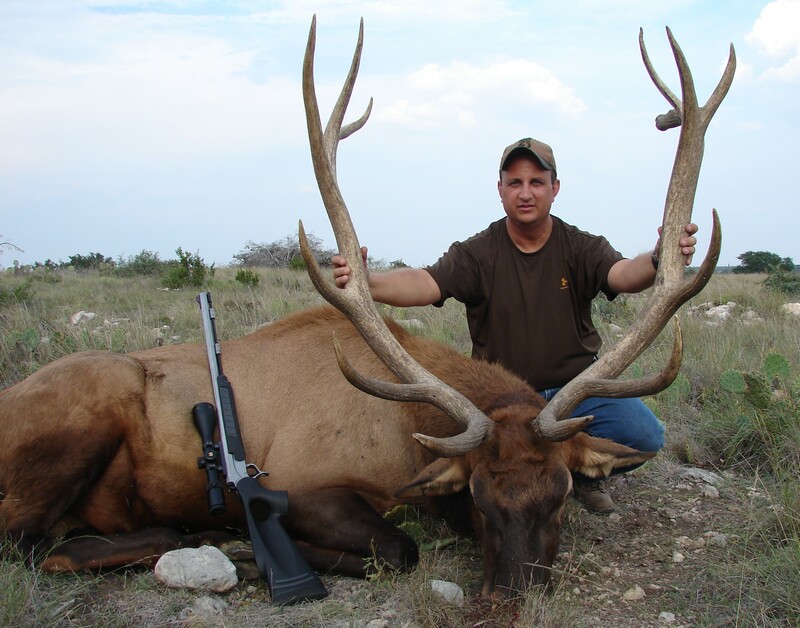 Elk are more than twice as heavy as mule deer and have a more reddish hue to their hair. The eland is the largest member of the antelope family. They usually tip the scales around 1,500 lbs. Both males and females have horns. The males horns usually grow up to 24 inches. Elands have the endurance to maintain a trot indefinitely and can jump an 8 foot fence from a standstill. Adult males have a mat of hair on the forehead that grows longer and denser as the animal ages. This exotic deer comes in three variations: white, chocolate, and spotted. Other than their brow tines, they have long palmated antlers much like a moose. Large males can weigh around 200 lbs. Fallow deer run in a distinctive stiff-legged fashion. Their hindlegs are slightly longer than forelegs, so the rump is held high. The Gemsbok is a favorite in the antelope family. 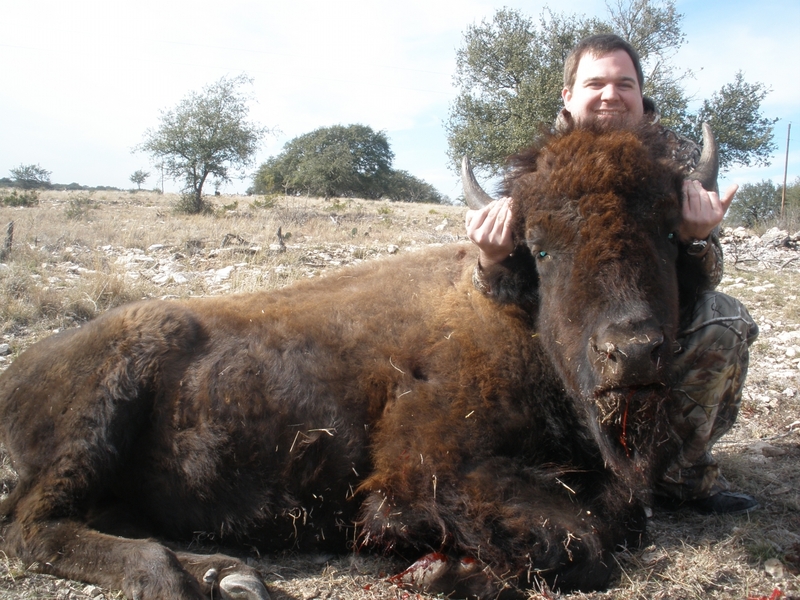 This large beautifully marked animal is a prized trophy for all big game hunters! Both sexes have long straight horns that can reach up to 40lbs. Their horns are long and extend straight back from the head. The hog deer has relatively short legs and a stock figure. 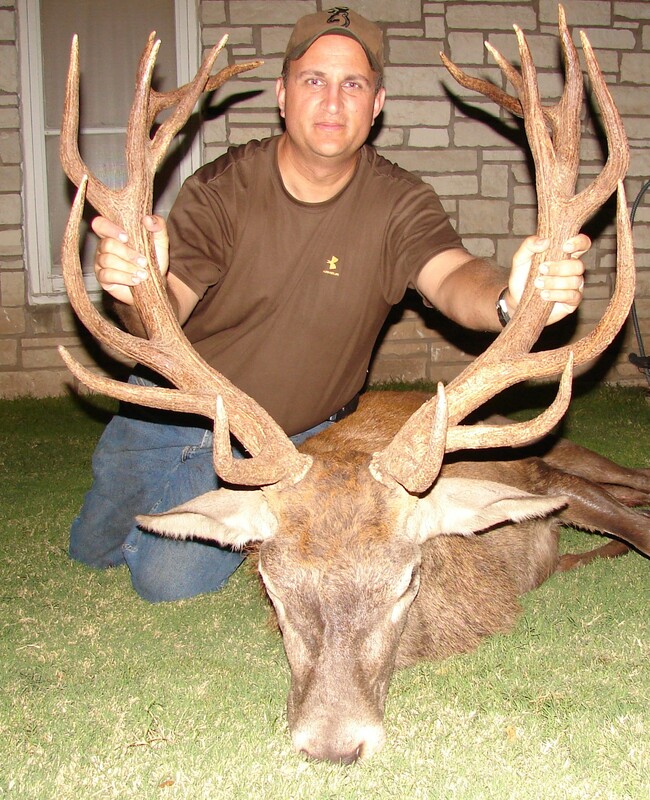 The males have three-tined antlers that may grow up to 24 inches in length. Hog deer have a stocky appearance, having short legs and a muscular body. 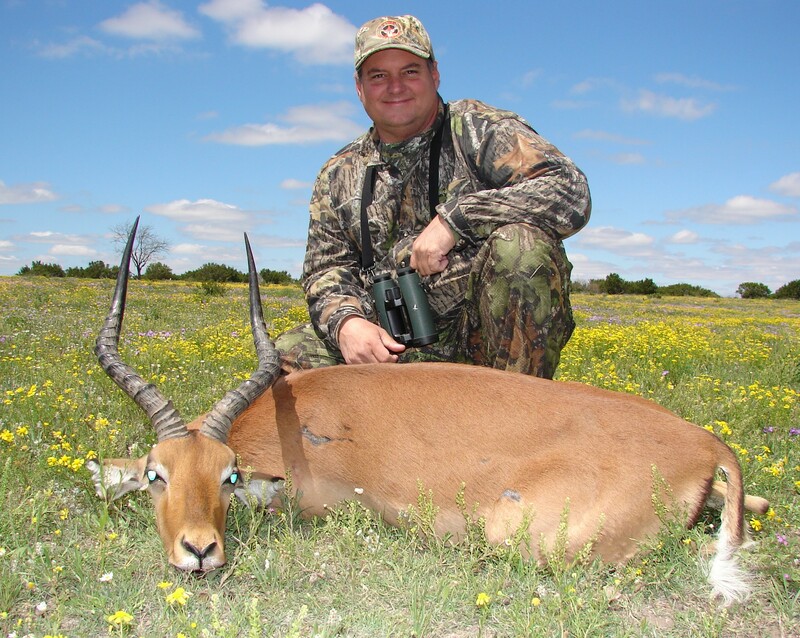 The impala is a medium sized African antelope. They are reddish brown in color with lighter flanks and underbellies. They can jump more than 30 feet in distance and 8 feet high. Their horns can reach up to 35 inches in length and average about 165 lbs. This animal stands about 3 1/2 feet tall at the shoulders and weighs between 30-50 lbs. The females of this breed are hornless and are golden brown with a white underbelly and no horns. Males are chocolate brown to russet with a white "hood" over their shoulders and small white patches over their eyes. They are most active in the early morning and late afternoon. The Nilgai is a large elusive animal that stands 4 to 5 feet tall at the shoulder. The bull can reach around 800lbs. The males horns are conical, tilted slightly forward, and are between 8 and 10 inches in length. If you've never eaten nilgai you're missing out on a delicious meal! The male nyala is about 3 ½ feet in height and has loosely spiraled horns. The male is dark brown with white on its face and neck and a vertical white stripe down his back. He has loose fringe like hair on his throat and underbelly. The kafue lechwe is a medium-sized reddish brown antelope with white undersides. The males have long lyre-shaped thin horns which are ridged along most of their length. 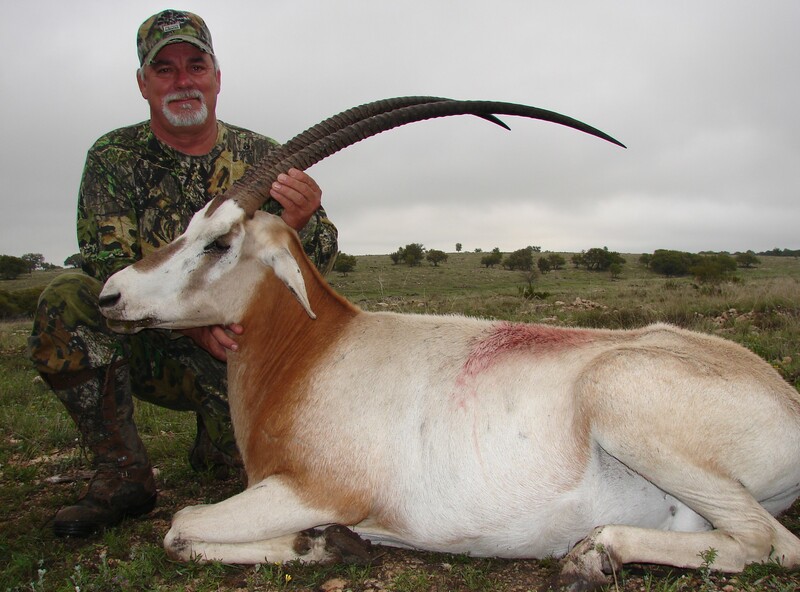 The scimitar-horned oryx is large bodied and can weigh up to 300 lbs. They are an attractive animal with a creamy colored coat and red around its neck. Both sexes have horns that can reach 40 inches or more in length. The Pere David's branched antlers are a sight to see! 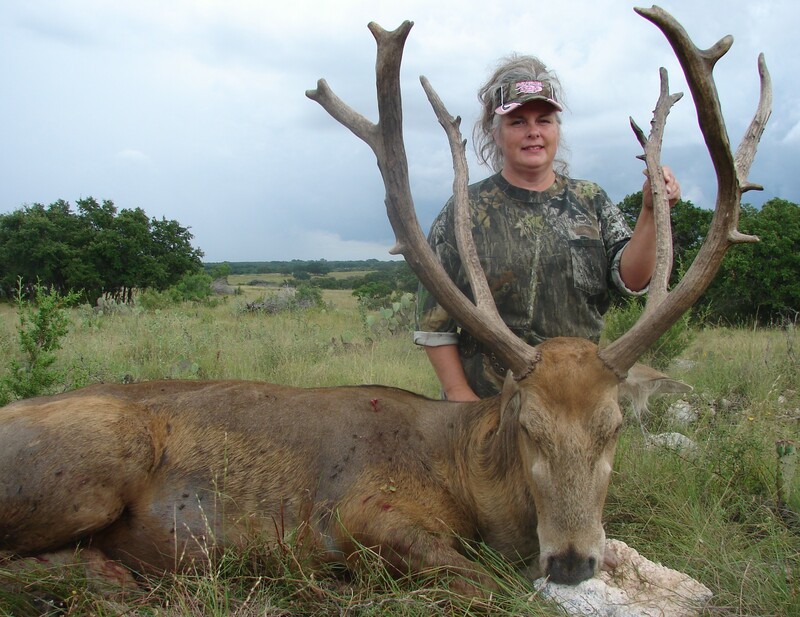 They weigh between 330-440 lbsm have a long tail, wide hooves, and branched antlers. The Chinese had a nickname for these deer meaning "four unlikes" because they have the hooves of a cow but are not a cow, the head of a horse but are not a horse, the antlers of a deer but are not a deer, the body of a donkey but not a donkey. The ibex is a type of wild mountain goat. Its large recurved horns are rigid on the front. They range in height from 27-43 inches, and weighs between 200-270 lbs. 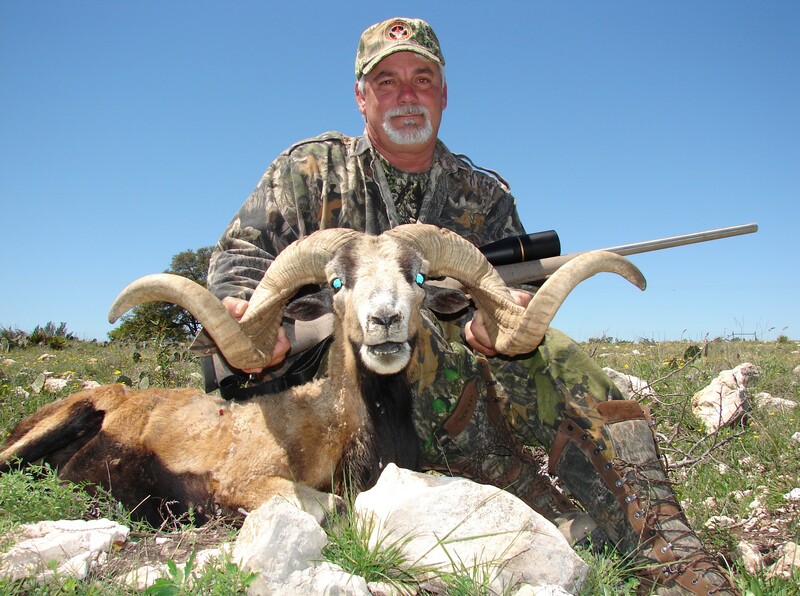 The mouflon is one of the most sought after trophies of sheep hunters. A mature male weighs about 110 lbs. It is red-brown with a dark area along its back, light colored underside as well as the bottom half of their legs. The curved, spiral horns are usually around 25 inches in length and arch back over its head. The red stag, or red deer, is one of the largest deer. It is found throughout Europe and parts of Asia, and Africa. The Red Deer is the only species of deer to inhabit Africa. The male is approximately 4 feet tall and weighs 650 lbs. The red sheep has rigid thick curved horns. 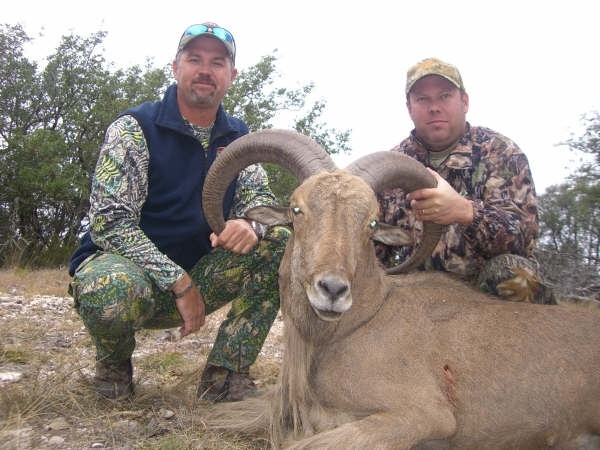 The average roan antelope is about 5 feet tall at the shoulder and weighs about 550lbs. They have short erect manes and ringed horns that arch backwards slightly. This impressive animal weighs in between 450-600lbs. The males are a distinctive black with a white underbelly. Sable antelope have ringed horns that arch backward. Sika deer are shorter in stature than white-tail deer, standing about 2 1/2 feet at the rump. Their coat is reddish-brown in the summer and dark brown to black in the winter. They have white spots running parallel down their back. Stags generally have a dark, shaggy mane running down their neck, and their antlers are narrow and sweep backwards rather than forwards like white-tail's antlers. The springbok is a medium sized brown and white gazelle that stands a little more than 2 ½ feet tall. Along each side there is a dark brown stripe extending from the shoulder on towards the inside thigh. These beautiful animals can reach speeds up to 83 mph. The Thomson's Gazelle is one of the best known gazelles. Most of the water they need comes from what they eat. They have a light brown coat with white underpants, and a distinctive black stripe. There horns are long and pointed with a slight curvature. They can reach a speed of up to 50 mph. The waterbuck is reddish brown in color and darkens with age. They have a white bib under their throat and a white ring on their rumps surrounding their tails. The male's long spiral structured horns sweep back and up. This antelope weighs in between 350-550lbs. The Watusi bull is a breed of cattle native to Africa. Their horns are similar to the Texas longhorn but larger. There unique horns are an incredible sight. It's name came form the conspicuous blue sheen on it's short haired hide. It has dark stripes on the throat and shoulders. 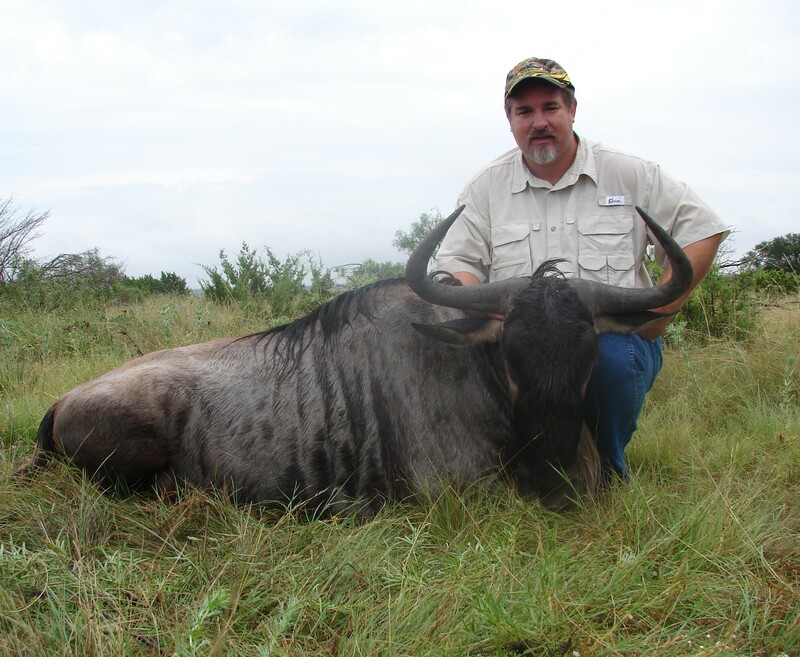 The black wildebeests coat is chocolate brown to black and is short and glossy in the summer, and becoming shaggier in the winter. It's average weight is about 400 lbs. The zebra is one of the most beautiful exotic animals! Its crisp black and white stripes are stunningly perfect. 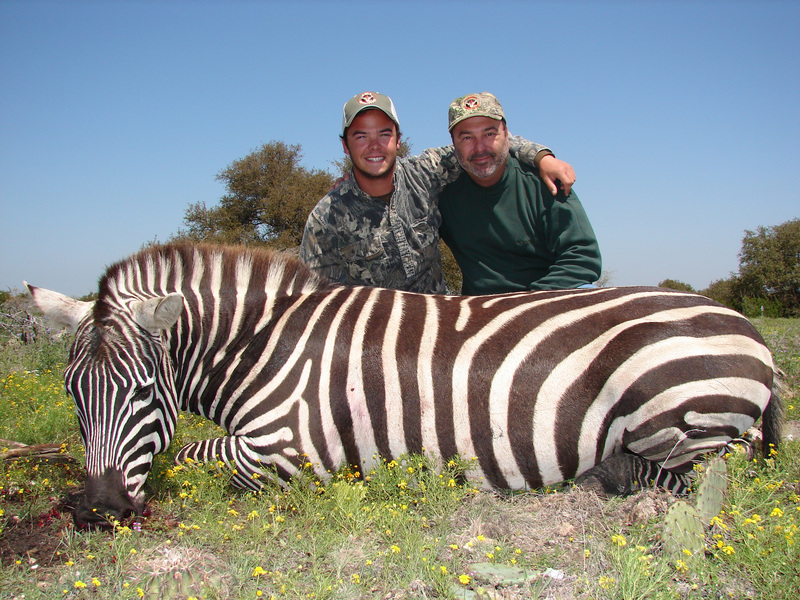 You can expect a zebra to weigh between 650lbs-900lbs.